On December 5, Larry Aasen turns 95 years young. As the big day nears, he’s going through scrapbooks and albums. Recently, in the Ellery Lane home he and his wife Martha have lived in for 54 years, Aasen recalled some intriguing stories. He was born in 1922, in a log cabin in the middle of a North Dakota snowstorm. There was no electricity, running water, central heating — not even a bathroom. When he got to New York City in 1949, he heard about a Times Square “gag writers school.” The $5 tuition was put into a hat, at the beginning of class. Aasen went on to work for the Better Vision Institute. Its mission was to encourage regular eye exams. The organization used celebrities in its ads. Because he had eye problems, Bob Hope did radio and TV ads for free. Toward the end of the comedian’s career, Aasen did a fundraiser with him in Miami. He was tired and weak. But when the spotlight hit him, he did a jig, picked up his violin and performed well. 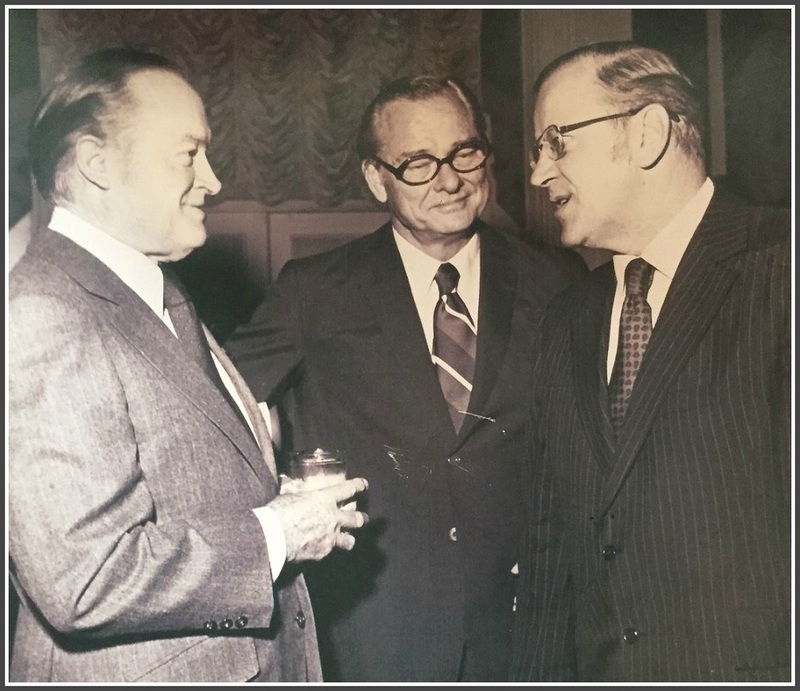 Bob Hope (left) and Larry Aasen (right). One day, a friend gave Aasen Muhammad Ali’s phone number. Aasen told the boxing champ the BVI wanted to use his photo on a poster. Ali, however, was more concerned about how Aasen had gotten his number. Aasen explained that the poster would read, “Your fists can’t hit what your eyes can’t see!” Ali yelled “Okay!” — then slammed down the receiver. Aasen and his wife are political junkies. In his long life, he’s met 6 presidents. Five years later, in Kansas City, Aasen learned where Harry Truman parked his car for his daily walk to work. Sure enough, at 8:15 a.m. he drove up. It was snowing hard. The former president was all alone. Aasen asked if he could walk along. Truman smiled, and asked Aasen where he was from. He said North Dakota, and that his wife was from Mississippi. The two men talked about those states’ senators, as well as the Hayes/Tilden “stolen” election of 1876. Then, after a firm handshake, Truman bounded up the office steps. In 1960, Martha’s father was a Mississippi delegate to the Democratic convention. The state shared a “very poor hotel” with the Wyoming delegation. Though they were small, and seemingly unimportant at the end of the roll call, candidate John F. Kennedy arrived at the hotel to meet them. Kennedy jumped out of a car, and shook Aasen’s hand. That night, Wyoming’s votes gave Kennedy the Democratic nomination for president. Ronald Reagan, Aasen says, was even better looking than his photos. Martha and he first met him at a motel in San Mateo in 1963, after a Rotary speech. The actor invited a group to his suite. He told jokes, in a disarming way. In 1975, Aasen was in Atlanta. Jimmy Carter walked down a hotel hall, put out his hand, introduced himself and said he was running for president. He invited Aasen to a speech. 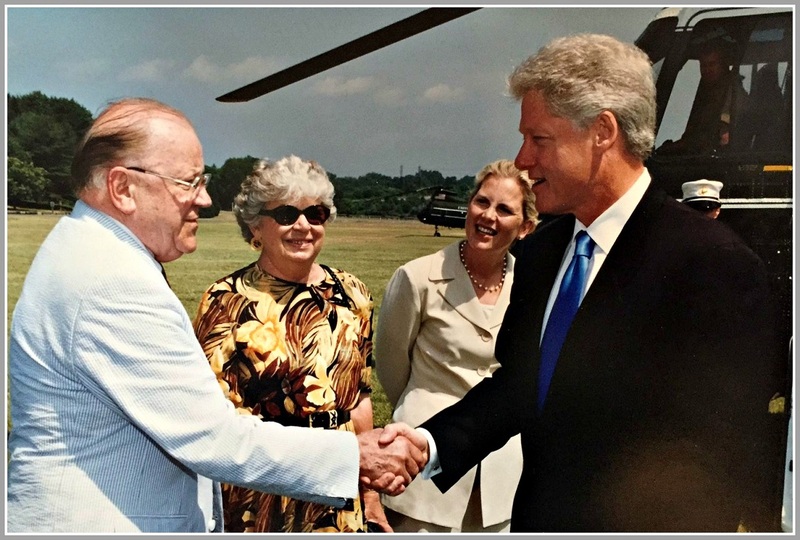 Larry and Martha Aasen, and then-1st Selectwoman Diane Farrell Goss greet President Clinton. His helicopter landed at Sherwood Island State Park. As for Barack Obama: Once, leaving a stage, he posed for a photo with the Aasens. “Let’s put the rose between the 2 thorns,” Obama suggested. 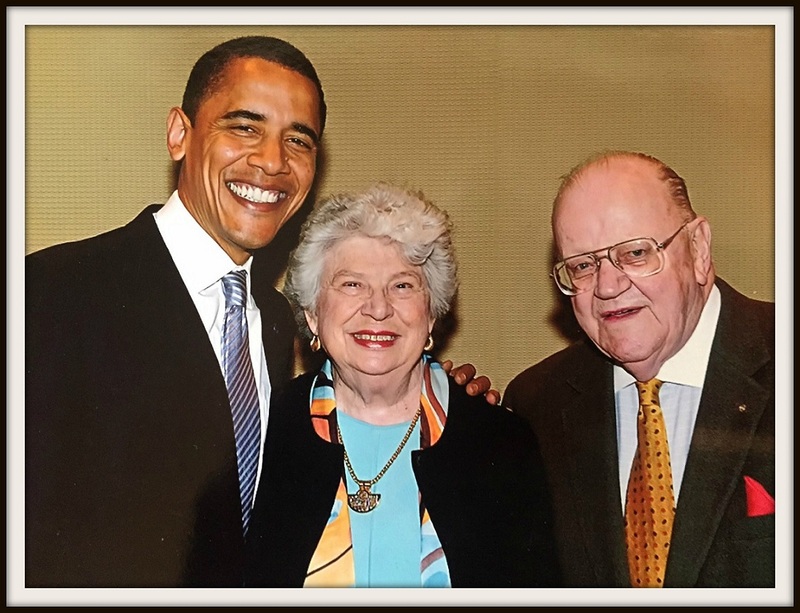 President Obama and Larry Aasen flank “the rose”: Martha Aasen. Happy upcoming 95th birthday, Larry Aasen. Here’s hoping you meet many more presidents — and have many more stories — in the years to come. This entry was posted in People, Politics and tagged Larry Aasen, Martha Aasen. Bookmark the permalink. Congratulations Larry, You have made the most of your 95 years. Congratulations and thanks for all you’ve contributed to Westport. Hope you and your bride have a wonderful celebration! Larry also has an outstanding collection of campaign memorabilia. Calling him a Political Junkie” is an understatement. Many more happy years, Larry! Wouldn’t it be fun (hint hint, Dan!) to post an article showing pics of some of that memorabilia? Larry and Martha are great contributors to the fabric of Westport it has been a pleasure to know them over all these years. Dan: you may not have known of or forgot to mention Larry’s joke books which are a treasure! Larry called it 6 presidents. I guess he doesn’t count Hoover! 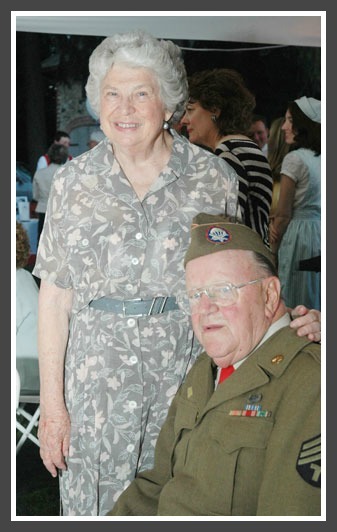 Larry and Martha Aasen are very fine human beings who have given so much to our community. I have learned a lot from them and I am grateful to have them as friends. Thank you for shining a light on them! Larry AASEN is one of the nicest people you are ever going to meet.I salute you on this milestone occasion. Happy birthday Larry! You and Martha are true jewels of this town. The Hogan/Diorio family –Lyn, Steve, Rob and Anna- send our best wishes to you for a wonderful day! Happy Birthday Larry! It’s been a joy to know you and Martha for all of these past years. We worked on many political campaigns together. We. won some and lost some, but we always gave it our best and always had fun. Here’s to the next campaign. just gotta say: Bob Hope did NOT play the violin. ever. it was the other guy, Jack, who played the violin, quite well. My husband Charles Lamb and I are very proud to name Larry Aasen among our close friends. We have worked together on political issues as well as just plain fun. This town and we Democrats have been lucky to have him. You and Martha are treasures in our Westport community! We’ve enjoyed knowing you these many years thru Rotary and other town functions.